Getting shocked is more than unpleasant, it can be lethal. An electrical impulse as small as 14 milliamps is enough to kill a person. Being handy with electrical work can help you keep your home in tip-top shape, save money by repairing appliances, and avoid household dangers. But you've got to be serious about safety if you're going to start messing with electricity. How to avoid electrical shock. And the picture shown is a fail. No bare conductor should be visible outside the terminal block. 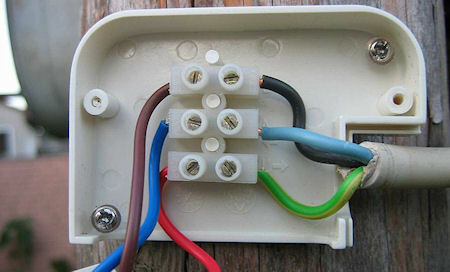 And the wiring colours? Where is that from.... Looks like the earth is hooked up to a live.